Additional Info: Decking/Veranda, 32" Freeview TV, DVD Player & DVD's, PS2 & Games, Travel Cot, Bed Guard, Highchair, Hairdrier, Ironing Board, Iron, Hoover, ensuite shower room to main bedroom plus separate toilet with sink. 22" Freeview TV/DVD Player to main bedroom. 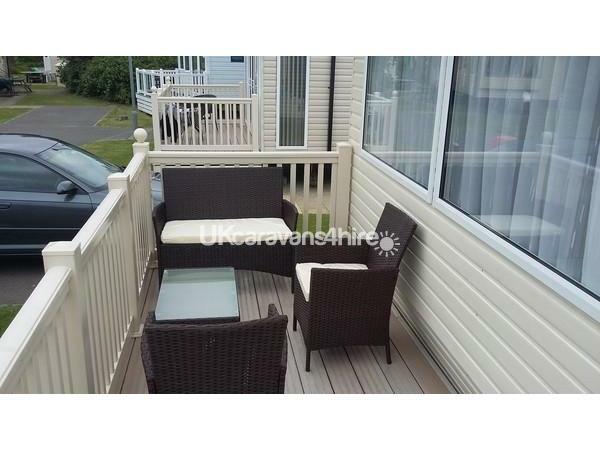 3 BEDROOM PRESTIGE CARAVAN WITH VERANDA/DECKING, CENTRAL HEATING AND DOUBLE GLAZING. 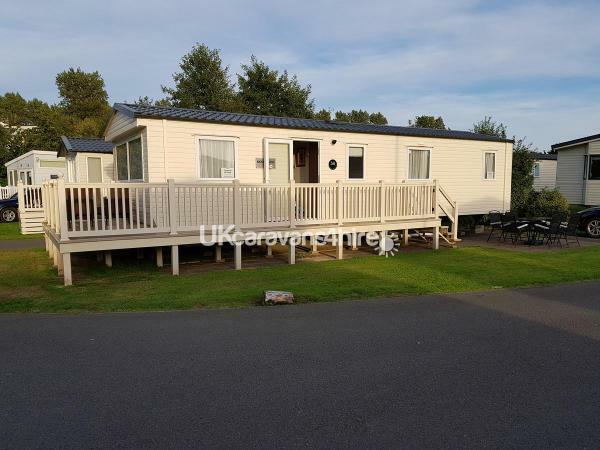 OUR CARAVAN IS SITED AT COMBE HAVEN HOLIDAY PARK, ST LEONARDS ON SEA, HASTINGS, EAST SUSSEX. We are offering, for hire, our privately owned 3 bedroom Prestige caravan that sleeps up to 6 people. It is 36 ft long x 12 ft wide. It is sited on one of the two premium pitches at Combe Haven, designed for owners exclusively, or Haven Prestige caravans, and has it's own driveway and patio and is in a quiet cul de sac. The main bedroom has a Double bed, the 2nd bedroom has 2 single beds and the 3rd bedroom has 2 single beds. The main bedroom has a 22" Freeview TV/DVD player and an ensuite shower room which is also accessible from the hallway. There is also a separate toilet with a sink . WE SUPPLY ALL DUVETS AND PILLOWS BUT YOU WILL HAVE TO BRING YOUR OWN BED LINEN, TOWELS AND TEA TOWELS. The caravan is fully equipped including a full sized cooker, microwave, kettle and toaster and a fridge freezer and all crockery, cutlery and pots and pans that you should need. It also has a hoover, travel cot, bed guard, high chair, iron, ironing board and hair drier and we would appreciate it if it was left clean and tidy after use. STRICTLY no smoking, even on the steps and no animals are allowed in the caravan for the comfort of future guests. Smoking is allowed on the Patio, away from the caravan. Any sign of smoking or pets will result in loss of the damage deposit and if we are advised, during your stay, that there is a dog in the caravan, you will be asked to leave and any money paid will be forfeited. There is a table and chairs on the patio and the parasol can be found in the hall cupboard. There is also a rattan sofa set with coffee table on the front decking and the seat pads can be found in the main bedroom wardrobe. ALL ELECTRIC AND GAS IS INCLUDED IN THE PRICE and there is no changing of gas bottles as it is metered. The caravan has central heating and double glazing so is lovely and cosy during the winter months. There are 3 kids clubs on site, an indoor sports hall as well as various outdoor pitches and a kids outdoor climbing play area. A 9 hole Pitch & Putt Golf Course is also on site. Inside the caravan is a 32" Freeview TV with a DVD player and Bluetooth Speaker in the lounge. We also have a selection of family and general viewing DVD's that may keep the family amused. PS2 AND LOADS OF GAMES. Combe Haven have a cafe bar that supplies excellent food and also a Burger King and Papa Johns. There are lots of amusements and pool tables to keep the whole family busy all day and an indoor and outdoor pool which are both heated and have been revamped in recent years to include a large SPACE BOWL FLUME. The Saxon Centre, which is one of the arcades on the site, is having a complete refit this year (2018) so watch this space! We will advise you on where to collect the key upon booking. PASSES ARE NOT INCLUDED unless stated. YOU DO NOT NEED PASSES TO STAY IN OUR CARAVAN OR USE SOME OF THE FACILITIES AT THE PARK ALTHOUGH PASSES CAN BE PURCHASED AT RECEPTION IF REQUIRED. REMEMBER THIS IS A PRESTIGE MODEL CARAVAN AT LESS THAN THE HAVEN STANDARD CARAVAN PRICE, PLUS LOADS OF EXTRAS! On top of the price of the holiday, we require a £75 refundable security bond/damage deposit which is returned to you once the cleaners have checked the caravan and confirmed that all is ok. Any soiling to mattresses as a result of wet damage of any description will automatically result in loss of damage deposit. Any extensive damage will result in police prosecution. This £75 deposit also acts as a holding deposit and is non-refundable if the holiday is cancelled. The remaining payment for your holiday is due 6 weeks prior to the holiday start date. FOR EXAMPLE:- If your holiday costs £250, then a deposit of £75 is due immediately and the remaining £250 due 6 weeks before you go. The £75 deposit gets refunded after you vacate the caravan and our cleaner confirms that all is ok.
My family and I had a wonderful stay in this caravan over the Easter break. The caravan itself was immaculately clean and we were impressed that it was so well equipped. The t.v in the bedroom was a great luxury as was the many dvd's to choose from. The bluetooth speaker was handy and the large towel rail meant that we could dry all of our swim suits. We will definitely be returning. Thank you to the owners for providing those small extra touches, they made our stay a home from home. Lovely caravan in a very good, quiet position on the park. The caravan itself was spotless and came equipped with plenty of extra facilities that you just don't get when hiring direct with Haven. Wouldn't hesitate to hire this caravan again. Hi Russell. Thank you for your review and we are pleased you and your family enjoyed your stay. We do pride ourselves on our caravan being over and above anything Haven could offer. Immaculate holiday home in a lovely quiet area. Lovely homely touches and facilities, the children loved the PlayStation. Communication from Sonja was first class, she even very kindly arranged to post a forgotten bag back to us. We are already planning our next holiday! Thank you, Emma for your lovely review. We are glad you all had a nice time and hopefully we will hear from you again soon. Thank you. I'm glad the kids enjoyed the holiday. We look forward to hearing from you again. Thank you James and Christine. We are glad you would consider us again for a future holiday and recommend us to your family and friends. Thank you. Thank you for your review. We are glad you enjoyed your holiday and hope you consider us in the future. Have just returned from a 4day break in your caravan,everything you could want you supplied.The caravan was spotlessly clean and the area was very quiet we couldn't have asked for better it was perfect will definitely book with you again. Thank you Wendy for your lovely review. We are glad you enjoyed your stay in our caravan and hope to hear from you again in the future. Best location in the caravan park, quiet plot. Enjoyable few days in a comfortable, spotlessly clean, well equipped caravan - just one thing, could only find 4 outside chairs but maybe we didnt look hard enough! Definitely recommend. We are glad you enjoyed your holiday. We do only have 4 outside chairs with the patio set. Thank you for your review and we hope you will stay with us again. Thank you, Brenda, for your review. We hope you consider us for a future holiday. From the first point of contact the owners were helpful, quick to respond and made the booking process very easy. We arrived to find a spotlessly clean, very well equipped and homely caravan which was situated in a lovely peaceful part of the site. 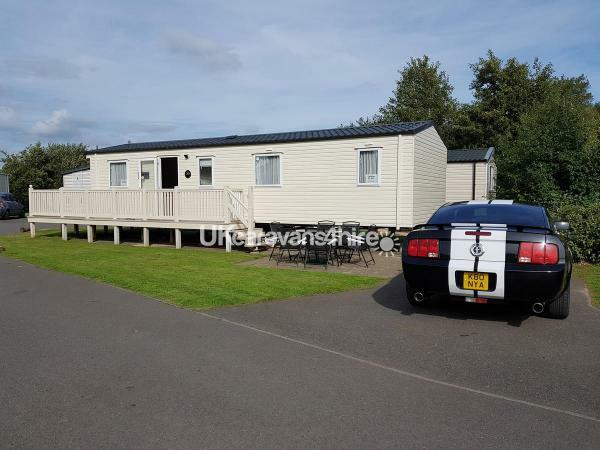 Lots of little extras were included which made our stay so much more pleasant, and on seeing some of the other caravans around the holiday park we were very thankful we had booked this one! Thanks Sonia for all your help, if we ever return to Haven we would definitely get in touch with you. Thank you so much Sheila for your review. We are glad you enjoyed your stay and hope to hear from you again. We had a fantastic time and the caravan was flawless. Loved the personal touches in the rooms and our child was over the moon to see a play station. The owners were so helpful and responded to all of our queries instantly. I would highly recommend this caravan! Thank you, Louise. I hope you and your family consider us for future holidays.